Hey, look! It’s another 2014 festival lineup! 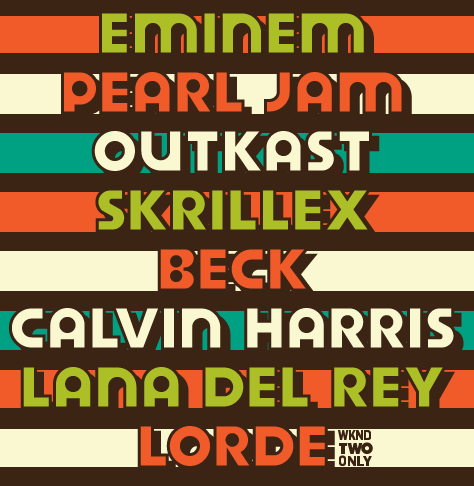 After expanding to two weekends for the 2013 festival, the 2014 edition of the Austin City Limits Music Festival will take place on October 3-5 and 10-12, featuring headlining sets from Eminem, Pearl Jam, Outkast, Skrillex, Beck and Calvin Harris. Given that ACL and Lollapalooza are produced by the same company (C3 Presents), there is typically a great deal of crossover between the two lineups. This certainly holds true in 2014, but it seems the identities of the two festivals are beginning to blur. ACL has always skewed older than its sister festival (last I checked, they still allow lawn chairs), and while Pearl Jam and Beck, along with undercard acts like The Replacements and Jimmy Cliff help ACL maintain that tradition, the lineup is missing the sort of legacy headliner ACL is known for. You used to be able to rely on ACL to deliver at least one truly legendary act along the lines of The Eagles or Neil Young, just as you were able to count on Lollapalooza for some 90s nostalgia from the likes of Nine Inch Nails or Rage Against the Machine. I don’t know if there are simply too many festivals nowadays, or if there just aren’t enough unique acts to go around, but I’d have a hard time identifying any of these lineups if the name of the festival wasn’t attached at the top of the poster. Check out the full Austin City Limits Festival lineup below, and maybe you’ll see what I mean.